It is recommended to take dietary supplement “Ginkgo Biloba Extract” by Farmakom to improve Your memory and cerebral circulation. This supplement has positive effect in case of attention and memory disorders, disturbance of mental activity, dizziness, tinnitus, disturbances of sleep, malaise, for meteoropathy. Fructose – 125.0 mg, lactose – 50.0 mg, whey – 50 mg, Ginkgo Biloba Extract 5% – 12.5 mg, calcium stearate – 10.0 mg, Aerosil – 2,5 mg.
Ginkgo biloba is a unique plant, being a natural source of biologically active compounds, providing favorable effect on the most important systems of the human body; improving elasticity of blood vessels and promoting their dilatation, improving microcirculation and oxygen supply to the myocardium, the brain and the extremities, preventing blood clots formation, stimulating mental activity, boosting immunity. Ginkgo biloba contains active ingredients, which are powerful antioxidants and are able to neutralize noxious effects of free radicals. The plant improves sight, retards its impairment with age. 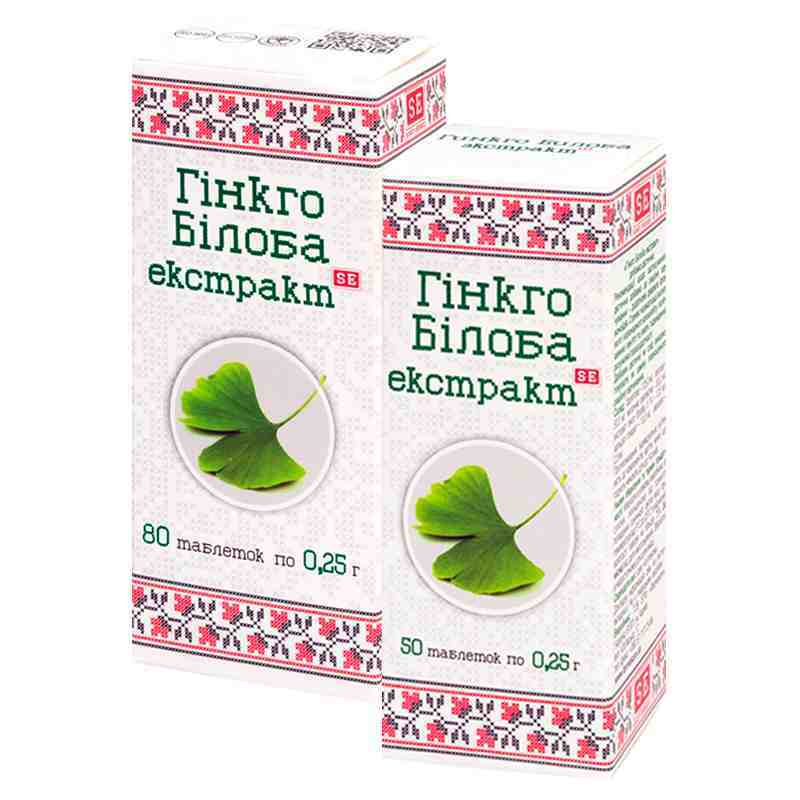 Ginkgo biloba has positive effect in case of attention and memory disorders, dizziness, tinnitus, disturbances of sleep, general weakness, for tolerance increase to external weather factors. Adults take 1-2 tablets thrice a day with a meal. Term of use is up to one month, further the term of use and the possibility of retreatment are to be agreed with a doctor. Proteins – 0.76 g, carbohydrates – 49.57 g, fats -0.08 g.
250 mg tablets N50 and N80.